Yes, the world of fanfiction certainly has a lot to offer, once one finally succeeds in finding a good fic. But every once in a while, a surprisingly genius one rears its head. Kiss or Kill by Mortalus is good all the way around, from the dialogue to subtle humor to plot and character development. In many ways, it does a better job of that than the books it’s based upon. I have very little negative to say about this one, so thus I am reduced to giving it my undying praise. Mortalus posted Kiss or Kill seven years ago, sometime after the release of the fifth book, and finished updating the story just over a month later. Twenty-seven chapters long, and clocking in over one-hundred thousand words, it gives quite a lot to discuss. Kiss or Kill is about the blossoming romance between one Harry Potter and Tom Riddle. Now, since I know some of you immediately thought of the age difference the moment you read that, don’t worry. The fic takes place during Harry’s sixth year, and I am pleased to inform you that Tom is also sixteen in this. How, you may ask. Well, the answer is simple: time travel. It may surprise many of you to know that I am not a fan of time travel stories, simply because I find that most don’t have a good explanation for what’s happening and instead creates a paradox. This is the same for actual movies, TV shows, books, etc., but most time travel fanfiction is just as bad, if not worse in explaining. One that thing that I notice fanfiction lacks more often than not are the characters giving an emotional response to what has happened outside of shock. Then, following that reaction, they continue on their merry way. Kiss or Kill doesn’t do this. The whole story centers on the time travel aspect, instead of using it as a contrived convenience to make the characters closer in age, and a large portion of the story is sacrificed to hiding the main character’s identity and coming to terms with his new reality. Another thing that sets Mortalus’s work apart from other Harry Potter time travel fics is that Harry does not get sent back to the past. Off the top of my head, I can name half a dozen fics involving Harry going back in time, seducing Tom, and subsequently making him good. In Kiss or Kill, Tom comes to the future, and he doesn’t become good, so much as he stops going down the path of evil. There is even a scene where Tom tells Harry that he’s never going to stop studying the Dark Arts, to which Harry responds that he’ll just make sure Tom doesn’t drown himself in it. And Tom is not a good person in this fic. By this point in his life, he’s already opened the chamber of secrets and committed murder, but at the story’s end, he’s definitely not a bad person either. I’m not really a fan of reading about Harry in Harry Potter fics, but this one got me. The building relationship between Tom and Harry is slow and believable, starting with them being friends before moving onto lovers. And hell if these two don’t have obstacles they need to overcome in order to make this relationship work. Furthermore, returning to the whole paradox-time-travel issue that arises, Mortalus gives a pretty good explanation. Because Tom’s coming to the future would inevitably change the course of history, time rights itself by splitting Tom in two, or more accurately, making a copy of Tom. One Tom stays in the past and grows up to be Lord Voldemort, and the other gets sent to the future. Upon Tom’s arrival in the present, Dumbledore is none too pleased, but he eventually makes the decision to keep Tom at Hogwarts, knowing that Tom will willingly stay due to everything Hogwarts has to offer. It’s almost like an invisible cage. Dumbledore does this as much for everyone’s safety as well as Tom’s. Since Voldemort’s survival doesn’t depend on Tom’s, Tom would have no use to him outside a means to become even more powerful, which is something Voldemort won’t hesitate to do, even if it means killing him. Thus, Dumbledore tries to keep his identity hidden, and the only people who know who Tom really is beside him are Harry, Ginny, McGongagall, and Hagrid. 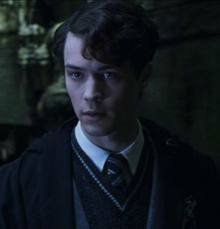 Harry is of course instructed by Dumbledore to keep an eye on Tom, and Tom in turn to keep Harry safe, as Dumbledore makes it clear that he’ll turn Tom over to the Dementors should something happen to Harry. And from here on, our relationship and shenanigans ensue. “That girl is wearing trousers!” Tom exclaimed loudly, stopping and pointing. The girl looked at him in astonishment. “And what is that thing on her back?” he asked, indicating the large bag she had strapped over both shoulders. At this point, Dumbledore grabbed Tom’s arm to drag him along and tipped his wizard’s hat to the girl as they walked quickly by, Tom staring at her until she hastily turned the corner, looking back at him in alarm. I particularly love when Tom pulls out a cigarette in front of Hermione and she gives him a lecture on the dangers of smoking. Tom, who had been unaware that cigarettes can kill, becomes very concerned for his health. It’s also things like these that start to tip people off to him not being who he says he is. But the parts between Tom and Dumbledore are some of the best, and they do a remarkably good job of making Dumbledore a more likeable character who doesn’t unjustly favor the Gryffindors over the Slytherins. It really develops the relationship between the two, and in the end, Dumbledore is almost like a father figure to him. There isn’t too much more I can talk about without giving anything else away. So if you want to know the story, check it out here. This entry was posted in Books, fanfiction, fanfiction fridays, Harry Potter, opinion, Reviews and tagged dumbledore, Fanfiction, fanfiction fridays, gryffindor, harry potter, Hermione, kiss or kill, mcgonagall, mortalus, sytherin, time travel, Tom Riddle by MadameAce. Bookmark the permalink. Will definitely check it out. Might learn a thing or two from it. Thanks. It’s really nice to see that people read what we say about fanfiction. I hope you like it. It’s one of my favorite fics, and I even had to fight with Lady Geek Girl to post this article, simply because she wanted to write about it.